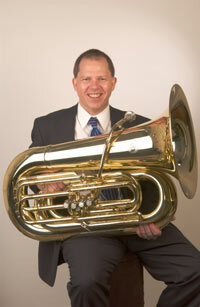 Tuba music tips for students and players - Keep Going! "Learn To Practice – Step 6: Keep Going!" Now that you have practiced your music using all of the first 5 Steps, you feel ready to play the music all the way through without stopping. When you do, KEEP GOING no matter what happens! Even though you have used all of the 5 Steps and really practiced well, you will still make some mistakes. Don't let this discourage you. It is perfectly normal and is to be expected. You will remember where your problems were, and you can go back and work on those places using the necessary Steps to improve them. It is VERY important that you keep going and run straight through your music at this point without stopping. This helps build your reflexes even more by developing your ability to RECOVER from a mistake. The truth is, no matter how well you play, you will still make mistakes. If you become a master at your instrument, you may be the only one to notice them, but they are still there. As you improve your ability to recover from a mistake and keep going, you will begin to ALMOST make a mistake yet prevent it from happening because your REFLEXES are much faster than they were. Stopping all the time teaches you to stop whenever you don't like something you played or think it is wrong, even if it is right. This is really a bad habit for performance! The way to develop this skill is to play the rhythm no matter what happens. This will help you keep going even if you miss fingerings and notes. Rhythm builds timing, and timing is coordination. The more you become coordinated on you instrument, you will make fewer mistakes and your recovery will be faster when you do make mistakes. As your recovery skills improves, you will make even fewer mistakes by having the coordination to prevent the ones you ALMOST make. REMEMBER: For this to work, you still must go back and practice your trouble spots more after you have played straight through your music. When you feel ready, run through the music again without stopping. Continue this process until you can play all the way through the music successfully several times in a row.